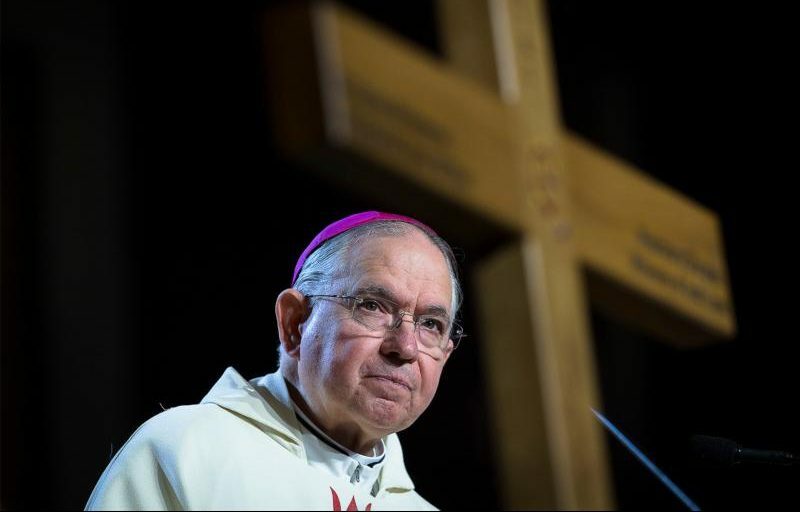 GRAPEVINE, Texas (CNS) — Hispanic Catholic leaders are living an important moment in the history of the Catholic church in the U.S. and are called to rise and continue the work of building the church, Los Angeles Archbishop Jose H. Gomez said Sept. 23. He made the comments during the closing Mass of the Fifth National Encuentro in Grapevine. Archbishop Gomez, who is vice president of the U.S. Conference of Catholic Bishops, was the homilist. The USCCB’s president, Cardinal Daniel DiNardo of Galveston-Houston, was the main celebrant of the Mass. Concelebrants were Archbishop Christophe Pierre, apostolic nuncio to the United States; Bishop Michael F. Olson of Fort Worth, the hosting diocese; and Archbishop Gustavo Garcia-Siller of San Antonio. Archbishop Gomez reminded the faithful that they’re missionary disciples on a journey, just like those who walked with Jesus in Galilee and Jerusalem. The journey eventually reached Latin America and was sealed with God’s love in the apparition of Our Lady of Guadalupe to St. Juan Diego, who entrusted him with the mission of building the church in the Americas. “Jesus entrusted the mission of his church in the New World to a layperson. Not to a priest or a bishop. Nor to a member of a religious order,” Archbishop Gomez said. “You are the children of Our Lady of Guadalupe in our present times; you are the spiritual heirs of Juan Diego. The archbishop invited participants to answer the call to be leaders by striving to be holy and to work united with their bishops. He also encouraged them to seek discernment as soon-to-be-canonized Blessed Oscar Romero did, by asking what God’s will for him was. “He is asking you to take your place in the history of salvation, and to do your part for the mission of his church,” Archbishop Gomez concluded. About 3,200 diocesan delegates, bishops and representatives from ecclesial movements and Catholic organizations participated in four days of dialogue and consultation to discern the priority issues for Hispanic ministry currently and for years to come. The V Encuentro, as it also is known, surpassed its goal of identifying and preparing 25,000 new ministry leaders. The three most pressing priorities identified focus on developing faith formation opportunities, strengthening families, and developing more paid positions for Hispanic youth and young adult ministries. Another important outcome of the Encuentro is the goal to develop initiatives that promote and create new pathways of leadership for young adults. “The experience of the Encuentro surpassed all my expectations,” said Guzman Carriquiry Lecour, the Vatican’s secretary of the Pontifical Commission for Latin America, who encouraged attendees to continue being committed to their ministries and expand their leadership and outreach. Father Raul Valencia is ready to put things into practice at his parish in Tucson, Arizona. “We have had an encounter with ourselves, with Christ, and with many opportunities and hope, to strengthen the pastoral ‘hispana,'” he told Catholic News Service. “What I bring to my diocese is this drive, this happiness and emotion that we carry after this gathering and looking at so many people involved in the same mission,” said Ricardo Luzondo from the Archdiocese of San Antonio. The V Encuentro is a multiyear process of missionary work, consultation, leadership development and community building. The last Encuentro took place in 2006. Hispanics represent about 40 percent of U.S. Catholics and nearly 60 percent of millennial Catholics, according to research from the Center for Applied Research in the Apostolate.